The first time I went to Huntington Beach (HB) that was in 1978 on a trip from France with the most prominent skaters of the time and the team “Frères Loubat photographers”. There was not a lot in the city: granted, someone had already planted the statute of Duke Kanahamoku, but the rest was kind of bare and forlorn. 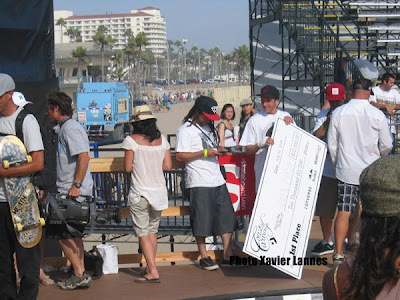 The last time I went to HB was this week end for the 3 days of the US Open of Surfing. In the lapse of 31 years, the coastal city went from desperate, forlorn and nearly vacant to one the most vibrant city of the west coast, a kind of amazing kingdom were all queens all have silicon breast, all kings smell fruity wax and, as far as I am concerned all princes bear small wooden sticks with urethane wheels. This influx of people brings its own problem: 2 hours to find a parking spot, then 30mn to walk from the forlorn spot to the beach full with almost undressed marauders. To make a long story short, this week-end (July 24th-26th) the small costal city turn itself into a veritable carnage: among thousands of people, during the US Open of Surfing, Converse, in conjunction with Red Bull & Skateboard Mag hosted their first Coastal Carnage. 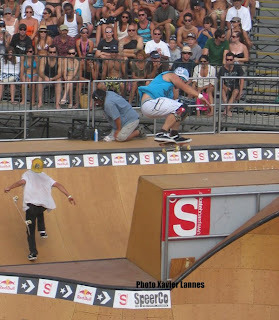 With skaters such as Rune Glifberg (who had flown in that morning from the Dew Tour in Boston) and Christian Hosoi in the competition, the stakes were high but the heats made the grown-ups scratching their heads and wondering what the hell happened to the new kids in the block: a trio of perfect amateur claimed the top spots. Curiously, the pro/am invitational had brought together a hodgepodge of both relatively unknown and top ams and top pros for a fun-filled and explosive series of bowl jams. The results, although unexpected, were fair but because the level was so high and everyone was shredding, judging must have been real hard. The uniquely designed and wonderful wooden double bowl featured a spine,a cradle, and a variety of hips and corners. The bowl was 5' deep with a 7' trans, 2' hip and 7' pocket along with long flat walls just over 28'. The beauty of the ramp is that it is all steel and is modular meaning it can become up to 15 different ramps. The jam format was broken up into 10 qualifying rounds which pit four riders against each other at the same time. Practice started on Friday, July 24th, with qualifiers running all day Saturday and then finals on Sunday. Raven Tershay an underground NorCal ripper tore the whole bowl up, cut his hand on Sunday afternoon, skated the whole time in a bloody tee shirt and came up to accept his first place trophy bandaged, T-shirt stained with fresh blood. With the victory came a check for $10,000. Congrats to Raven and the Tershay family. Yes, Raven deserved the 1st place, but baby Curren Caples really owned a bowl full of grown men in their 40’s and full-sized teens. Given his size and age, his level blew my mind. While he boosted insane airs to the max, he lofted stalefishes, almost landed a flyout transfer kickflip and made insane tricks like kickflip front tailslides, kickflip lips and kickflip front blunts. He got 2nd. Kevin Kowalski got 3rd, Tom Remillard won the best trick with a 5-0 to a drifty fakie in the oververt capsule.